We will figure the tax based on the month the vehicle was first used in the period. The tax due has to be paid to the IRS by available Payment Options. By e-filing the amended Form 2290, you have to pay by the last day of the month following the month in which the mileage use limit was exceeded. A corrected schedule-1 copy with the VIN and other details will be stamped by IRS and the same will be sent to you by email. At Tax 2290, you have the option of printing the corrected Schedule-1 copy by logging into your personal account. You also have the option to subscribe for a copy by FAX. An increase in maximum load customarily carried or any such scenario can lead to an increase in the taxable gross weight of your vehicle. In such a case, you have to report it to the IRS and pay the applicable tax amounts that are due, due to your new taxable weight category. Form 2290 has a provision to report the additional tax for the remaining tax period and this has to be done by the last day of the month following the month in which the taxable gross weight increased. Figure the additional tax using the following. Identify the month the taxable gross weight increased. 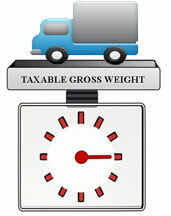 Determine the new taxable gross weight category. If the increase in taxable gross weight occurs in July after you have filed your return, you still have to report a new form 2290 amendment form for the additional tax. While reporting a Form 2290 for your vehicle, by mistake if you have filed for a wrong Vehicle Identification Number [VIN] then you have to file a new amendment for VIN correction. Given the length of Vehicle Identification Number (VIN), it is very understandable that certain characters in it could be mistaken. Tax2290 enables smooth filing of form 2290 amendment to correct your VIN entry mistake.